Montauciel Takes Flight at Lifeline celebrates science and the spirit of invention. You know a children’s show is successful if the kids are singing the songs on the car ride home. The charming original musical Montauciel Takes Flight, by James E. Grote (book) and Russell J. Coutinho (music and lyrics), directed by Aileen McGroddy, is based on the true story of the first living creatures to ride in a hot air balloon. The play tells the story of the Montgolfier brothers, paper manufacturers in 1783 France who launched a balloon containing a duck, a rooster and a sheep named Montauciel, a name that means “climb-to-the-sky.” The balloon and its animal occupants landed safely after traveling over two miles, ushering in a new era of manned flight. The heroine of the musical Montauciel (Kirra Silver), is a curious young sheep who loves science. Silver communicates a youthful enthusiasm for science and learning that immediately draws children into the narrative. Her genuineness makes her character relatable to kids. She never plays down to them, rather she invites them to share in her excitement. Silver is well supported by the cheery ensemble playing her human and animal compatriots: Jordan Arrendondo (Joseph Montgolfier), Carisa Gonzales (Bessie), Scott Ray Merchant (Etienne Montgolfier) and Jennifer Vance (Rooster). There’s a strong opening number about “the age of enlightenment” during which Montauciel muses that some folks fall in love with science and learning, while others seem afraid of science, preferring the old ways. Embracing the wonders of science is part of the show’s message. When Montauciel hears intriguing explosions coming from the Montgolfier paper mill she leaves home in hopes of meeting a fellow science enthusiast. When she arrives she discovers the sounds were coming from Joseph’s lab. He’d rather do science than make paper and so he hires her to work in his place so he can spend his time experimenting. She’s disappointed but soon learns making paper involves science too. After a quick lesson in how old rags are turned into paper pulp it’s her turn to instruct her new employers (some human and some animal) about “the six simple machines” in the show’s most memorable number. The song admirably manages to turn this unwieldy list into a catchy tune. Indeed, my children were singing about “the wheel and the axle, the lever and the pulley, the inclined plane and the screw (and the wedge)” the rest of the afternoon. Montauciel also covers the scientific method, teaching her friends to formulate and test a hypothesis. She gently coaxes Joseph Montgolfier toward understanding science is more than just setting off cool explosions and he invites to join him in his work. Soon their experiments attract royal attention and the inventors go on an adventure to meet King Louis XVI and Queen Marie Antoinette, played by a talking portrait with mouth holes, much to the delighted squeals of the children in the audience. Lifeline’s signature aesthetic features costumes and design elements that elevate everyday things with a little theater magic. I appreciate this because it shows children how simple it is to take the objects around them and transform them into elements of a story. 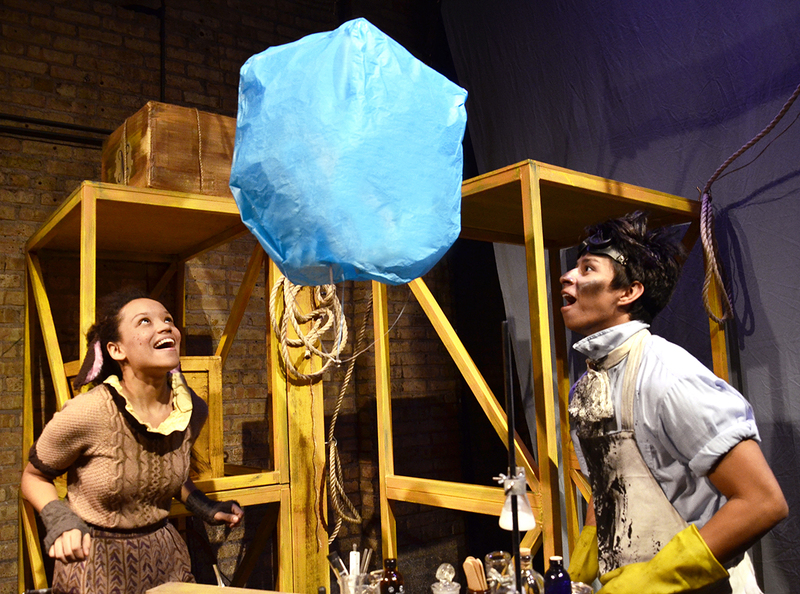 It’s thrilling when the characters create their wondrous balloon from found objects. The blue sheet backdrop representing the sky starts to billow when the animals start their journey and suddenly we are all flying. After the show my children were excitedly discussing the types of paper and fabric the Montgolfiers used to make their balloons and speculating how they might conduct their own hot air experiments. Montauciel Takes Flight makes both science and theater accessible to kids. Most children’s productions at Lifeline are adaptations of well-known books making Montauciel a slight departure, though a well-executed one. As a parent I celebrated that this play links science to everyday problem solving and brings to life an exciting but oft overlooked historical event, the invention of the hot air balloon. Parents may well find themselves just as inspired by the show’s spirit as their kids. BIAS ALERT: My children are close friends with Lifeline House Manager, Susan Tecktiel, a beloved babysitter to them since they were toddlers. * This show is recommended for kids 5 and up. Children under 2 are not permitted.